We’re still anxiously awaiting our return to our permanent property. The work on our new house is progressing, and the kitchen is starting to take shape with cabinets being set into position. Every day brings a new dilemma like what kind of outlets should be installed on the island? Hopefully, all of the issues will be solved soon, and I’ll be in my new kitchen in time for holiday baking season. I realized how much I’ve missed more frequent baking as I turned the pages of Yvette Van Boven’s newest book Home Baked . I recently received a review copy. I was hooked on this book from the very beginning thanks to the tips for homemade vanilla extract, natural food coloring, and a list of flours from various grains to use. The Bread chapter won me over quickly with tender Potato Rolls, Spicy Italian Anchovy-Garlic Bread, and the use of a sourdough starter for bread and pizza dough. The recipes are a mix of sweet treats and some more wholesome options with whole grains and less sugar. There are cakes, bars, cookies, pies, and pastry, and even treats for canine friends. I took one look at the Speculaas cookies and wanted to find out how to order a board with a windmill mold to make them. (Incidentally, I found one here.) And, the Pear Caramel Pies with Walnuts look decadent with the crisp puff pastry and drizzles of homemade caramel. Since I’m still doing my best to keep sugar intake at a minimum, I decided to try the Carrot Banana Cake. 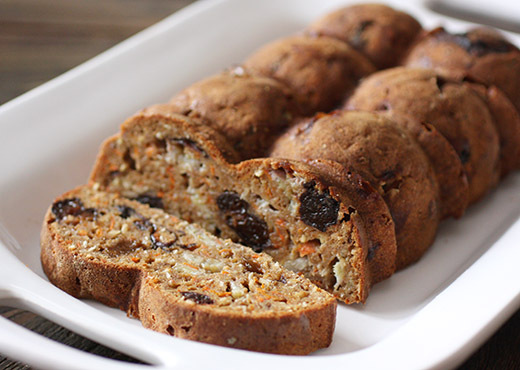 It’s a cross between a carrot cake and banana bread, and it’s lightly sweetened with just a couple of tablespoons of honey. The rest of the sweetness comes from apple juice, carrots, and the fruit in the cake. This is a little different from other banana bread recipes because the bananas are sliced rather than mashed. There were supposed to have been dried apricots in the recipe, but as seems to happen to me often with various ingredients, the day I needed dried apricots there were none to be found. I used dried plums instead. To begin, apple juice (and I love that organic unsweetened apple juice was recommended), grated carrots, halved dried plums in my case, and honey were combined in a saucepan and brought to a boil. The pan was removed from the heat, and it was left to rest for 30 minutes. Spelt flour, grated unsweetened coconut, baking powder, ground ginger, and salt were sifted together. There’s a note that cinnamon is nice here as well, so I added some. 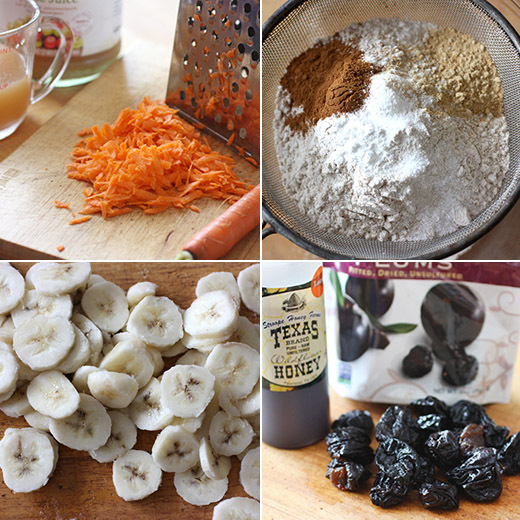 The carrot and apple juice mixture was added to the flour mixture, beaten eggs were stirred in, and last the banana slices were folded into the batter. The cake baked for about 50 minutes. I tasted the batter just before transferring it to the baking pan. I thought it tasted not sweet enough and worried the cake would be bland. But, it didn’t occur to me that I was tasting plain batter with no banana in it. Once the cake was baked and sliced, and the banana slices were evenly distributed and found their way into each bite. They added just enough extra sweetness. 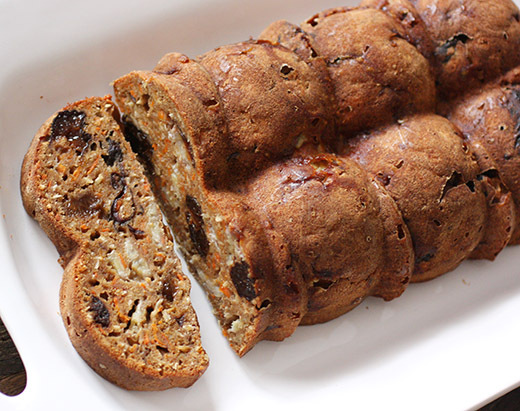 I loved the texture with the carrots and all the fruit, and I wouldn’t change a thing the next time I bake it. Now, if we can just get moved, I can wait to start breaking in my new, roomier kitchen with lots of baking. Recipe reprinted with publisher’s permission from Home Baked . Oh, delicious. Look, I figured: I love carrot cake, I love banana bread, why don’t I throw the two together and combine them into a single thing I love? The cake doesn’t contain any sugar, butter, or wheat, so it’s pretty healthy. But by adding the apricots, banana, apple juice, and carrot, it ends up being pretty sweet anyhow. If you can’t get spelt flour, you can of course simply use wheat flour, I won’t stop you. Bake this cake and bring a thick slice to work. It’s the perfect snack. for 1 cake, prep 25 min., inactive 30 min., bake 50 min. Preheat the oven to 350ºF (180°C). Position a rack in the center. Thoroughly grease a 1 1/2-qt (1.5-L) loaf pan, or any other pan with approximately the same volume. I use some melted coconut oil, but baking spray or olive oil also works fine. In a saucepan, bring the apple juice, carrot, apricots, and honey to a boil. Turn off the heat and allow to rest for 30 minutes. Let cool until the mixture is nearly at room temperature. I usually spoon the mixture into a large dish to make sure it cools faster. Meanwhile, combine the flour with the coconut, baking powder, ginger, and salt. Then spoon in the carrot mixture. Stir in the beaten eggs and finally the banana slices. Pour the batter into the prepared pan. Bake the cake for 50 minutes or so. The cake is done when a skewer inserted into the center comes out clean. Let it cool in the pan, then turn out onto a rack. Once cooled off, the cake will be slightly firmer. Late summer though fall is the season for shelling peas or field peas, and that category includes purple hull peas, creamer peas, and black-eyed peas to name a few. They all grow well here, and I seem to end up making something very similar to the ragout shown here every year at about this time. This year as we received a bag of fresh field peas in our CSA box every other week, I popped the bag into the freezer each time. I also had extra corn that I cut off the cobs and stored in a bag in the freezer. I took my time deciding how to use my frozen stockpile, and I still have more field peas stored away for a different use. 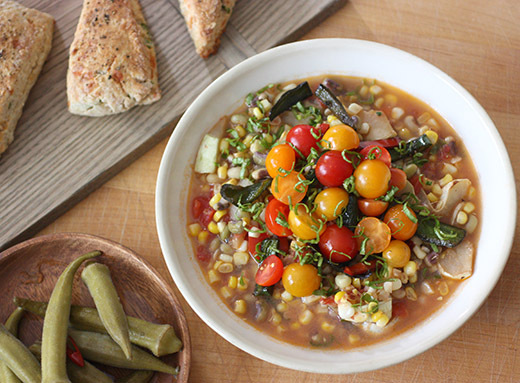 The combination of black-eyed peas, sweet and spicy peppers, summer squash, tomatoes, and corn is a classic. I remembered this particular version from the book Vegetable Literacy by Deborah Madison, and it was just what I wanted. Also, when I make something like this ragout every year, I always make some kind of cornbread to accompany it. This time, I took inspiration from the Breads of the Southwest book for savory scones with cornmeal, jalapenos, and cheddar. Once last thing to include is my fermented okra pickles, and this is the meal that defines the transition from summer to fall for me. To get started, the fresh, or in my case frozen, black-eyed peas were cooked in water with a bay leaf until tender. I used a mix of sweet and spicy peppers cut into small strips, and those were sauteed in olive oil until softened, and then balsamic vinegar was added and stirred into the peppers. The peppers were set aside, the pan was wiped clean, and sliced summer squash was sauteed and browned. I used some local pattypan squash. The black-eyed peas were drained, and the cooking liquid was reserved. In a Dutch oven, butter was melted for cooking minced onion. After a few minutes, corn, chopped tomatoes, and the drained peas and some of the cooking liquid were added. This mixture was left to simmer for a bit before the cooked squash joined the ragout. A few tablespoons of cream was stirred in at the end. The ragout was served garnished with the sauteed peppers, halved cherry tomatoes, and sliced basil. I think I come back to something like this dish every year at the start of fall because it’s hearty and light at the same time. The cooked summer vegetables make a filling but not-too-filling stew, and the raw tomatoes and basil on top brighten up the flavors. 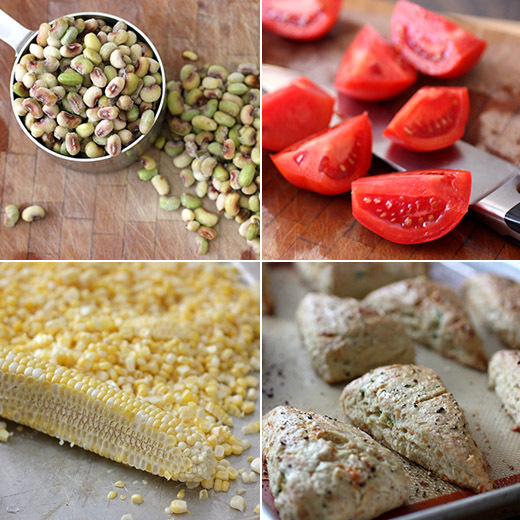 And, it’s made for dunking cornbread or cornmeal-jalapeno-cheddar scones. Now, I can choose something new and different for using the rest of my field peas stash. Sometimes new cookbooks don’t draw me in right away. I might need to read a few pages to get a feel for the style of cooking in the book, and eventually I start getting excited about the dishes. That was not the case with Zahav: A World of Israeli Cooking . My first look inside the review copy I received had me completely intrigued. The colorful, vibrant salads and vegetables dishes, the various rice dishes and pilafs, and skewers of grilled chicken and salmon with flavorful marinades left no doubts that I’d enjoy this book. Zahav, the restaurant, opened in Philadelphia in 2008, and this book presents the mix of dishes from the menus over the years. Chef Michael Solomonov writes that these dishes “make an impression of a cuisine that is evolving.” They reflect an idea of Israeli cooking, but at times, traditional approaches are changed to accommodate what’s available and in season at the restaurant. I like this thought of the food giving a sense of a culture and a place and not sticking too strictly to original versions. I learned that “tehina” is the same thing as “tahini,” and it’s invaluable in Israeli cooking. It’s used to add richness without the use of cream or butter for keeping kosher. 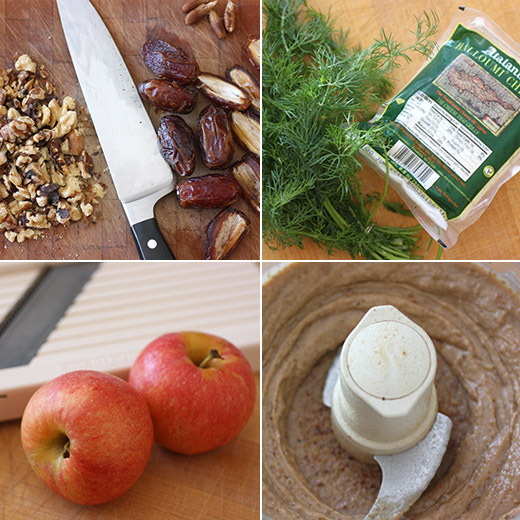 It’s used in hummus, of course, but also in many other applications both sweet and savory. For instance, there’s a vegetable dish in which cooked green beans are mixed with sauteed mushrooms and tehina sauce and then topped with lentils and crispy garlic. I’m noting that for my Thanksgiving menu. One recipe I already tried was the Latke with Gravlax. It’s one big latke made in a skillet and turned in one solid piece. There’s no onion, flour, or egg, just grated potatoes cooked in oil. It was simple, crispy, and delicious. The vegetable-filled borekas are similar to turnovers and are made with a dough kind of like puff pastry, and I want to try them all. I also want to attempt making laffa flatbread. The recipes in the book quickly caught my attention, but so did the writing. Solomonov shares his stories about living in Isreal at different times and his training as a chef. There are interesting historical insights like the fact that Israeli couscous was first made as a wheat-based substitute for rice when there was a rice shortage. And, there are explanations about the mix of cultures that make up Israel and how the food represents many different origins. There’s so much to appreciate here from the Pumpkin Broth with Fideos soup to the Chocolate Babka served with cardamom-flavored Turkish Coffee Ice Cream. I’ve been making use of our fall fruits in salads like arugula with pears, gorgonzola, and pecans and mixed greens with apples, pecans, and goat cheese. I can’t get enough of the mix of sweet, tart, nutty, and salty. 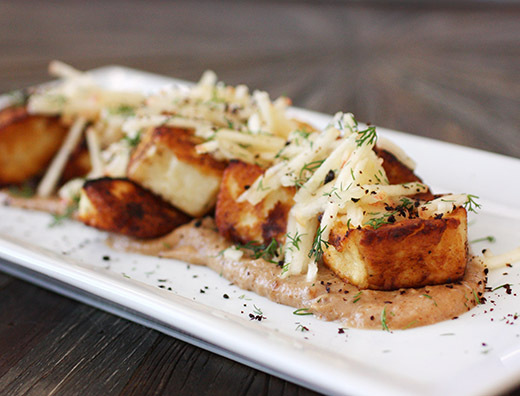 With these flavors already on my mind, I had to try the Crispy Haloumi Cheese with Dates, Walnuts, and Apples recipe. And, I can never resist a dish with haloumi. Pitted dates, toasted walnuts, olive oil, sherry vinegar, pinches of salt, and some hot water were combined in a food processor and pureed until smooth. This paste formed the base of the dish. 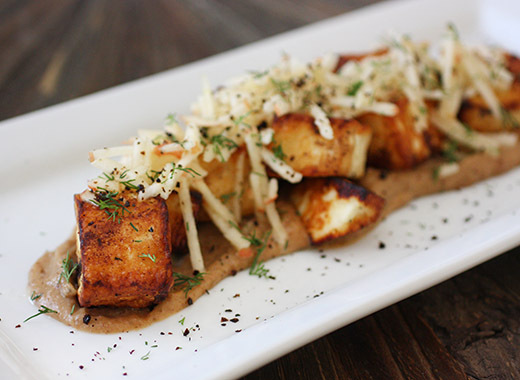 Next, cubes of haloumi were sauteed in oil until golden on all sides. These were set on top of the date paste. Last, an apple was cut into matchsticks, and I used a Benriner, and those little sticks were perched on top of the haloumi. Dill and Urfa pepper were sprinkled on top to finish the dish. In the head note for this recipe, it’s mentioned that this dish cannot be taken off the menu at the restaurant because it is so well-loved. I can understand completely. This is such a good mix of textures and flavors, and haloumi works its magic when paired with something a little sweet like the dates here. And, crisp, fresh apple brightens the combination. Now, I need go shop for fideos to try that soup I mentioned, and I really want to attempt making Persian rice and about 20 other recipes as well. Recipe reprinted with publisher’s permission from Zahav: A World of Israeli Cooking . Combine the dates, walnuts, olive oil, vinegar, a couple pinches of salt, and 1/2 cup hot water in a food processor and puree until smooth. Set the date paste aside. Film a skillet with canola oil and heat over medium-high heat until the oil is shimmering but not smoking. Arrange the cheese cubes in a single layer in the skillet and cook, turning, until the exteriors are golden and crisp, about 2 minutes per side. Spread the date paste over the bottom of a serving plate and add the fried haloumi. 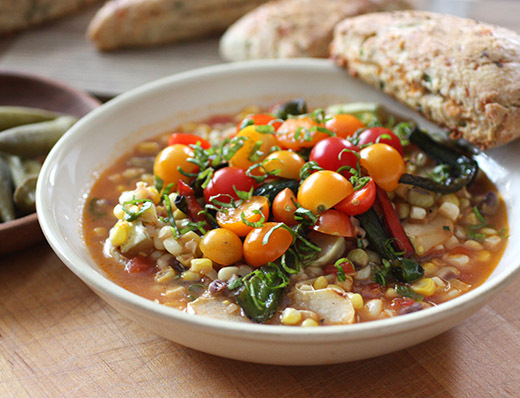 Top with the apple, dill, and Urfa pepper, and serve immediately.